This book, Human Values for Success in Family and Business, is based upon a mixture of European ethics, Confucianism humanism, and American frontier family practices. The concepts of this book have been proven statistically by the results of the American counterculture 1956-1974, feminism, equal rights, and American frontier family survival. All religions, nationalities, and cultures can utilize the principles in this book to achieve happiness in many ways besides financial success. An unhealthy body cannot enjoy financial success any more than an unhealthy family can enjoy their lives together. When people treat each other like family members, in any relationship, the world is a better place. Of course, this book explains how to treat family members. As a hippie, musician, record producer, construction contractor, union representative, Freemason, Kung Fu master, Tai Chi teacher, and Mr. Mom, I have experimented, tested, and learned how to apply these principles to daily life. I look forward to sharing, and debating these concepts which will revolutionize marriage, business, and public education. 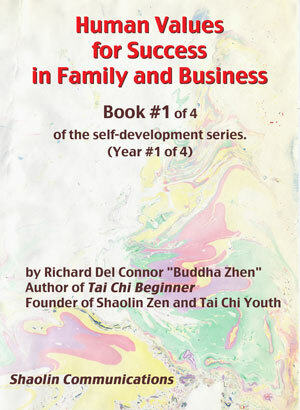 This book, Human Values for Success in Family and Business, was originally designed as weekly essays to be studied by the students and disciples of Buddha Zhen in his Kung Fu and Tai Chi Classes. This four-year program is synchronized with the Kung Fu and Tai Chi programs of Shaolin Chi Mantis, Buddha Kung Fu, and the Tai Chi Youth nonprofit organization. Each chapter contains quotations, philosophy, self-help, how-tos, and stories that illustrate these concepts: how they work, and how they don't work. The concepts of this book teach how to plan for certain results, avoid certain problems, and understand the underlying power structure of families and business. Whether the man is a Mr. Mom, or the woman is the CEO, this book will provide the characteristics required to create a balance of power, based upon the people actually involved. Although this book will provide an understanding of an ideal traditional marriage of parents or business partners, the real perfect marriage is the one that works best for the people involved. 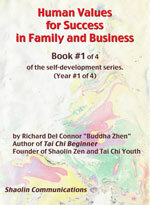 This book, Human Values for Success in Family and Business, will enable people to create the ultimate relationship based upon the actual abilities and true characters, sexes, and positions of influence of the persons involved.